It’s not a new story that WPBakery Page Builder for WordPress supports extension. This popular plugin inspired developers to create tones of VC Add-ons which makes life even easier for both professionals and beginners users of websites. 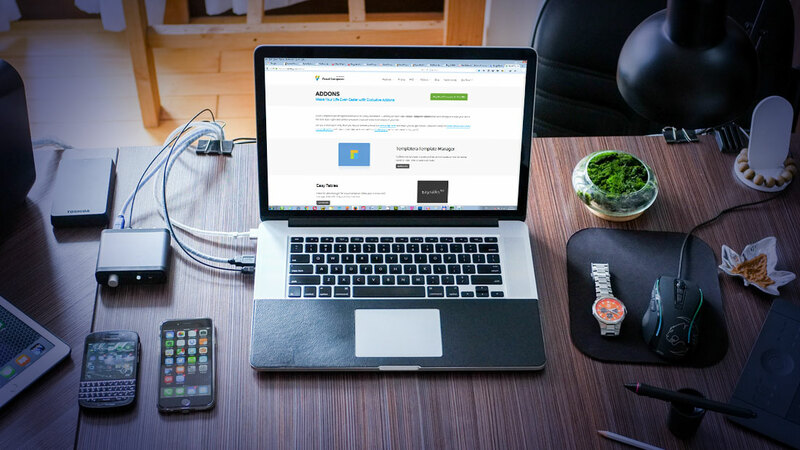 Here is a list of the 8 best of these VC Add-ons and extensions to be found on the web. Vera Bundle is full of VC Add-ons. All those VC Add-ons – those included and those to be included in this bundle – have detailed video tutorials, that show how to install and setup. What means “those to be included”? That refers to all future VC Add-ons the team is working on. 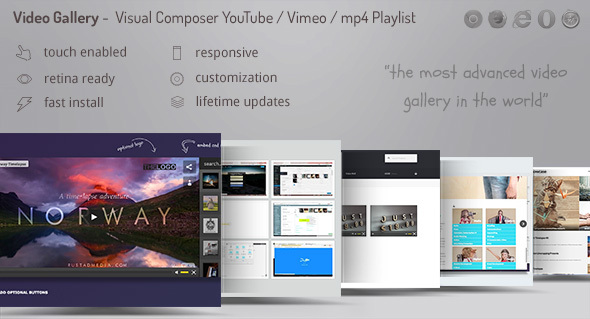 This Visual Composer Add-on supports YouTube, Vimeo and Self-Hosted videos and is a top-notch responsive HTML5 plugin compatible with all major browsers and mobile devices. It plays YouTube, Vimeo and Self-Hosted video files. For YouTube and Vimeo, all you need to use is the video ID. 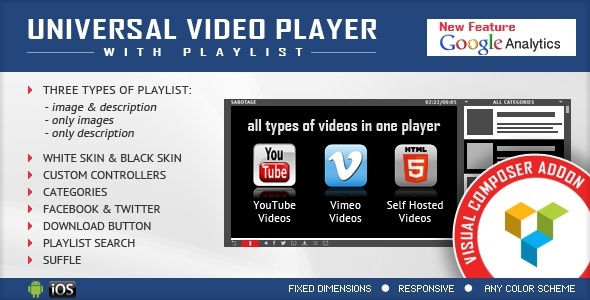 All you need to use is the YouTube video ID and the plugin will get these information from YouTube server. Parameters to use your own information. The JS file has around 55KB. 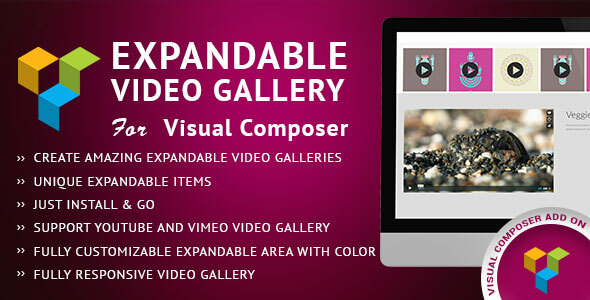 Expandable Video Gallery wordpress VC Add-on plugin, with this addon plugin you can make unique multiple type video gallery. No coding required. Just with very easy steps. You can also CHOOSE DIFFERENT COLOR FOR DIFFERENT EXPANDED AREA, TITLE AND CONTENT. Just Install and Go. Free support. Youtube and Viemo gallery Support. Create Multiple Type Video Gallery With Easy Steps. Parameter to use Server Time or Computer Time. T he circles are built using HTML5 canvas, so the circles will not appear in IE7 and IE8 since these 2 browsers don’t have HTML5 support. 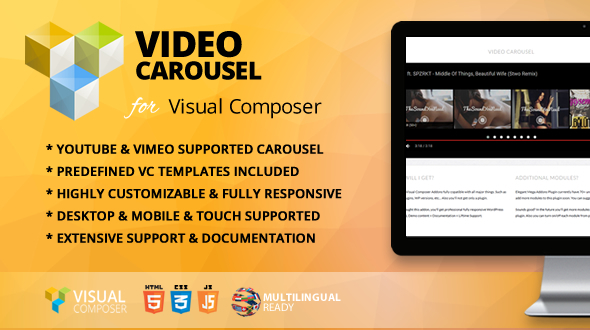 You can create responsive video carousel with Video Carousel Addon for Visual Composer WordPress Plugin in any page. Video Carousel addon displays your videos with awesome effects in in anywhere. 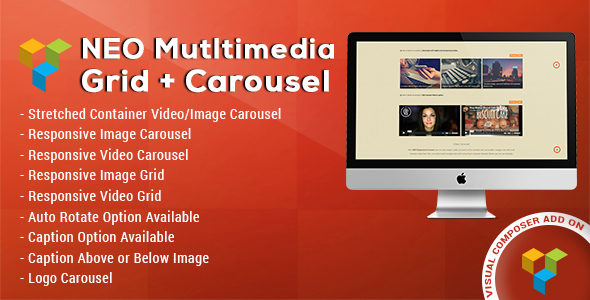 Using NEO Multimedia Gird+Carousel VC add-on plugin you can create a multiple type images/video carousel or grid. In this plugin you can play autorotate image/video carousel using advance option. Using this plugin also user can create full width/streched container image/video autorotate and static carousel. In this plugin you can also set image/video size, rotation time. User can also set margin between item, also set caption with enable/disable option. If you need only the WordPress Plugin for Chameleon Playlist HTML5 audio player jQuery plugin, you can download it from here. 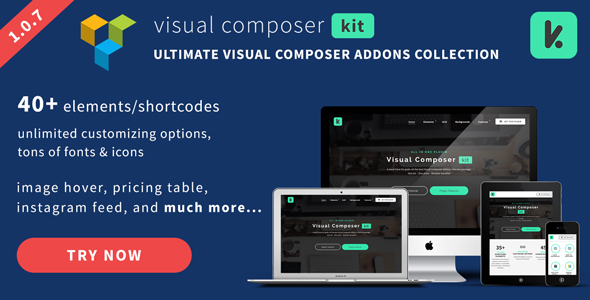 Visual Composer KIT is a powerful collection of over 40 VC add-ons crafted for your WordPress site. With all trending elements and highly customized features, wrapped in just one bundle, we offer you unlimited possibilities to easily style and modernize your website. Grab this awesome all-in-one package and impress your visitors now! Responsive, localized, awesome, fully featured, fast. full of choices – set up single videos, gallery of hand picked videos, gallery of mixed video types – youtube / dailymotion / selfhosted / audio files / images / vimeo / etc. , gallery of a youtube user channel, gallery of a vimeo user channel, gallery of a vimeo album, gallery of a youtube playlist etc. subtitle support– you can have captioning – the gallery reads .srt type subtitles and adds captioning to your videos – wow. backup database / import, export feature – keep your database safe and do regular backups via the Export Database feature included with this plugin. easy to install – install and get this plugin ready in less then three minutes. auxiliary shortcodes – want to get a single video in your post without having to go through the admin? You just have to set the id for the youtube or vimeo shortcode, or the location for the video shortcode. shortcode generator – this gallery is based on shortcodes but you do not need to remember none because there is a Shortcode Generator above every editor in the post / page. 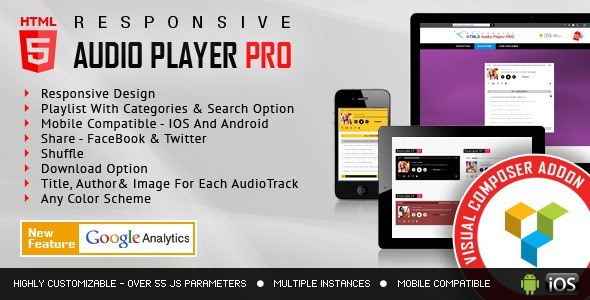 This Visual Composer Addon – HTML5 Audio Player PRO is a top-notch responsive player compatible with all major browsers and mobile devices. Any color scheme possible, customizable from parameters.